Sometimes in life, good fortune shines upon you, and you happen to be in the right place at the right time. That’s precisely what happened to Katie Huff, an agricultural and life sciences graduate student at the Delta Research and Extension Center. A Helena, Arkansas native, Huff attended Phillips Community College/University of Arkansas and then later attended Delta State University where she earned two degrees; one in biology and the other in environmental science. 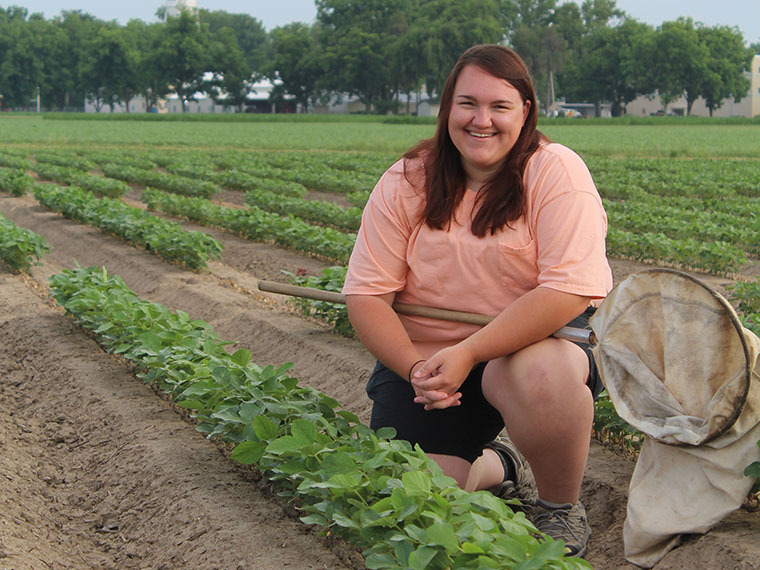 After graduation, and in an attempt to get her foot in the door, Huff applied for a summer job at the Delta Research and Extension Center, working with entomologists. After the summer term was over, Dr. Jeff Gore, associate extension and research professor, invited Huff to work with him as a master’s student. And this is where her fortune turned for the better. Prior to working at the Experiment Station in Stoneville, Huff had little interest in farming or entomology. Her closest relative that farmed was her great-grandfather who raised rice in south Louisiana at the turn of the last century. And the only entomology class she took was general entomology at Delta State. However, Huff recognized an excellent opportunity and jumped at the chance to begin working on her master’s under the direction of Gore and Dr. Don Cook, another MAFES entomologist. Since working at the Experiment Station, she has discovered a passion for entomology. Huff’s primary focus is the soybean looper, a migratory insect pest from Central and South America. The soybean looper is a defoliator, in other words, it eats leaves, which in turn affect the photosynthesis of the soybean plant, thus potentially impacting yield. The current treatment threshold for loopers is 20 percent defoliation, or 19 looper larvae per 25 sweeps with a sweep net. The defoliation threshold was verified within the last eight years, while the larval count threshold was first published many years ago. Huff’s research seeks to determine if the larval count threshold correlates with the defoliation threshold. Huff will also evaluate alternative looper insecticides for management and resistance monitoring. Soybean looper has a history of developing insecticide resistance. While the pest overwinters in South Florida and South Texas, the majority of loopers migrate from Central and South America and the Caribbean where year-round crop production occurs, resulting in continuous insecticide selection pressure. This intensive growing season contributes to insecticide resistance development in the soybean looper. Finally, Huff will determine the correlation between sweep net and drop cloth counts as there is not an available conversion factor between the two methods of determining soybean looper thresholds. While her research is still ongoing, initial findings have shown a reduced efficacy of some insecticides against certain soybean looper populations. Her findings will help ensure farmers are treating the insect pest as needed to maximize yields and profits. This research was funded by the Mississippi Soybean Promotion Board.